Poaching is an excellent way to cook seafood, since the cooking liquid makes a flavorful base for sauce. This recipe features a French technique called monter au beurre (to mount with butter), whereby chilled butter is whisked into the cooking liquid at the last minute to ensure a satiny sauce. Heat oil in a large Dutch oven coated with cooking spray over medium heat. Add leek and garlic; cook 4 minutes or until tender, stirring occasionally. Add wine and broth; bring to a simmer. Stir in shrimp and scallops; bring to a boil. Reduce heat; simmer 3 minutes or until shrimp and scallops are done. Remove shrimp and scallops from pan with a slotted spoon; keep warm. Bring broth mixture to a boil; cook 4 minutes. Reduce heat to low. Add butter, stirring constantly with a whisk. Stir in chopped tomato and remaining ingredients. 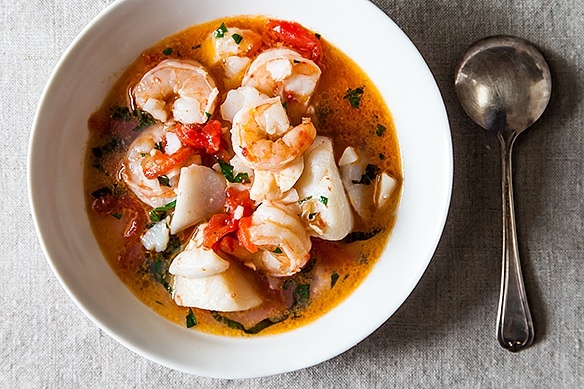 Divide shrimp and scallops evenly among 4 soup bowls; spoon 3/4 cup broth mixture into each bowl.